Width: 87 mm, height: 77 mm, length: 252 mm. Square profile style with connectors on each side. The connectors are moulded onto a plastic plate in banks of four. Each connector has IDC connections. If required these connector plates can be slid out of the extrusion and replaced with steel panels. There is a choice of panel, punched for 4 or 8 unified D or plain. The advantage of panels punched with D cutouts is the opportunity to fit any unified connector. 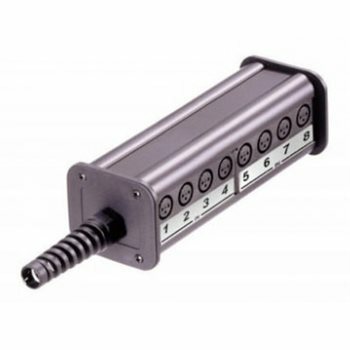 For example: XLR, Speakon, Jack, PowerCon, BNC, Phono, Ethercon, USB or Firewire.